Design in Australia, 100% polyester. Lightweight polyester, portable, waterproof, and weighing just 40 grams each, these groovy bags are available individually or as a series of 5 contained within a handy pouch. With reinforced seams, each surprisingly large bag can hold a weight the equivalent of two supermarket plastic bags. 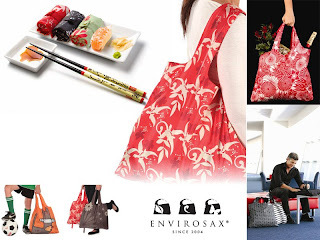 :: Easy to store even in a normal sized handbag - ingeniously roll up and snap into a lightweight 40g package. :: Throw a couple into your car's glovebox and you will never be without one. :: Comfortable to use - hike it up onto your shoulder one-handed. Great when your other hand is occupied with other stuff. The Botanica Series is inspired by the earth's beautiful, lush and bountiful rainforest. 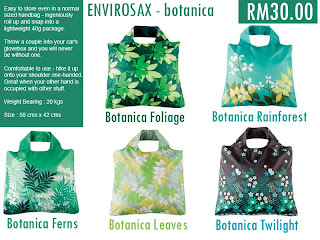 Bold in colour and imagery, Botanica is a daily reminder of Mother Earth's natural splendor! In the spirit of raising awareness of the importance of our planet's rainforest and of the threats they face, Envirosax is presenting a series of articles about endangered rainforest around the world. There is no quick fix to the problem of global warming, but a lot of small steps in the right direction will add up to one big step. Educating the next generation in the responsible re-use of bags, Envirosax Kids' will help tomorrows future move in the right direction. 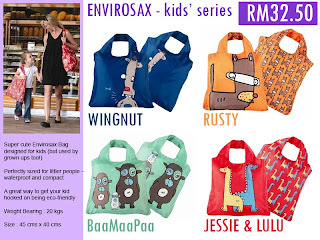 :: Super cute Envirosax Bag designed for kids (but used by grown ups too!). :: Perfectly sized for littler people – waterproof and compact. 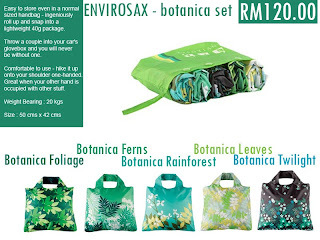 :: A great way to get your kid hooked on being eco-friendly. The 5-IN-1 pouch is a great way of buying all 5 bags at once. The pouch is small enough to fit into a handbag or the glove compartment of a car. No more excuses for leaving your reusable bags at home! 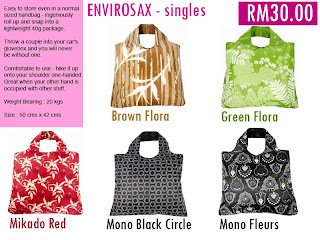 Hi, envirosax sale ni for any design ker? do u have mono slowflakes? 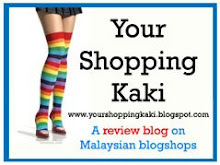 i link your site: link your site... improve it!